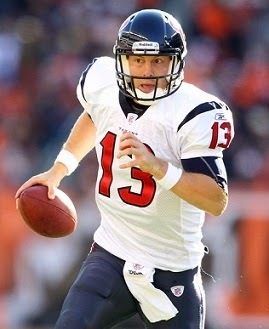 The Houston Texans did not reach the postseason in their first nine years of existence, but stood poised to win a division title as they faced the Cincinnati Bengals on December 11, 2011. Coached by Gary Kubiak, the Texans had an outstanding defense, but attrition was a problem on offense. T.J. Yates (pictured above), a rookie fifth-round draft pick out of North Carolina, had taken over at quarterback when starting QB Matt Schaub and then backup Matt Leinart went down with season-ending injuries in consecutive weeks. The first-year quarterback was making just his second start and was also without star WR Andre Johnson, who was sidelined by a strained hamstring. But RB Arian Foster was a steady performer and the Texans had won six straight games after a 3-3 start to come into the contest at Cincinnati with a 9-3 record. Cincinnati, under Head Coach Marvin Lewis for the ninth year, was moving in the opposite direction, having started off at 6-2 before losing three of four games to barely be in playoff contention with a 7-5 tally. QB Andy Dalton and WR A.J. Green were both rookies who moved directly into the starting lineup with promising results. As had typically been the case since Lewis took over as coach, the defense was solid. There was a small crowd of 41,202 fans in attendance at Paul Brown Stadium. The teams traded punts to start the game before the Texans mounted a scoring drive. 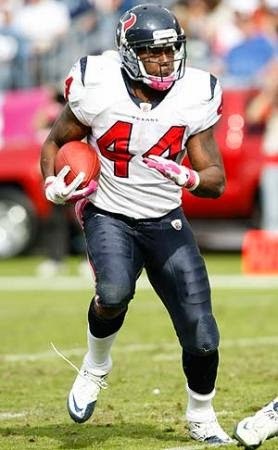 After Arian Foster gained 11 yards on two carries, RB Ben Tate (pictured below) broke away for 44 yards to the Cincinnati 32. Houston was able to pick up another four yards before Neil Rackers kicked a 46-yard field goal. The Bengals responded with a scoring series of their own. Andy Dalton completed a pass to WR Jerome Simpson for 21 yards and RB Cedric Benson followed up with a 42-yard run to the Houston one. 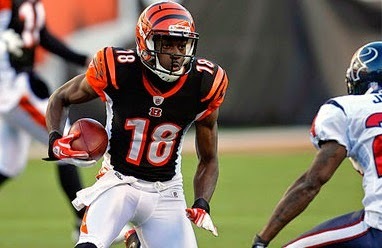 The failure to reach the end zone mattered as the home team was immediately backed up five yards by a false start and the Bengals were able to regain only two yards before Mike Nugent kicked a 22-yard field goal that tied the score at 3-3. FS Reggie Nelson intercepted a T.J. Yates pass on the next series and returned it 23 yards to the Houston 25. The Bengals lost ground from there but still took the lead when Nugent kicked another field goal, this time from 47 yards. In a series that extended into the second quarter, Yates completed passes to TE Owen Daniels for 27 yards, WR Kevin Walter for 19, and Foster for 21. But after reaching the Cincinnati one, LB Rey Maualuga forced Tate to fumble and the Bengals recovered. Cincinnati proceeded to drive 97 yards in 15 plays. Benson ran effectively and Dalton had a completion to TE Jermaine Gresham that picked up 26 yards. The Bengals converted two third downs and, facing a fourth-and-three situation at the Houston 35, Dalton passed to A.J. Green for 11 yards. Finally, Dalton threw down the middle to Simpson for a 17-yard touchdown. Nugent converted and the Bengals were up by 13-3 with three minutes remaining in the first half. The Texans put together an effective drive in response as Yates went to the air and had completions of 24 and 18 yards to Daniels, five yards to WR Jacoby Jones, and six to Foster. But after reaching the Cincinnati 30, Rackers missed on a 47-yard field goal try. With the clock now down to 30 seconds, Dalton threw to WR Andrew Hawkins for 22 yards and to Gresham for 10 to set up a 49-yard Nugent field goal. Cincinnati carried a 16-3 lead into halftime. The Bengals had the ball first in the third quarter but Dalton fumbled when sacked by LB Connor Barwin and LB Brooks Reed recovered for the Texans at the Cincinnati 17. Houston capitalized when, four plays later, Yates passed to TE Joel Dreessen for a six-yard touchdown. Rackers added the PAT and the home team’s lead was cut to six points. The teams traded punts until the Bengals, starting from their own two yard line, drove all the way to the Houston 10. A pass interference penalty accounted for 25 yards and Dalton threw to Green for a 36-yard gain to the Houston 9. Cincinnati lost a yard over the ensuing three plays and Nugent came on to kick a 28-yard field goal that extended the lead to 19-10. In a series that extended into the fourth quarter, the Texans advanced into Cincinnati territory. Yates threw to Foster for 17 yards and Jones for 16 and ran for 12 yards on his own to convert a third down, but he also fumbled when hit by DT Geno Atkins on a sack and DE Jonathan Fanene recovered for the Bengals at the Cincinnati 48. The resulting possession was short and ended with a punt. On Houston’s next series, Yates completed seven passes, the longest to Walter for 19 yards, and the Texans reached the Cincinnati 15 before the drive stalled. Rackers kicked a 33-yard field goal to again make it a six-point contest. The Bengals again had to punt following the next series and the Texans started at their 20 yard line with 2:33 left in regulation and no timeouts remaining. Yates was again effective passing the ball, connecting with Daniels three times for a total of 26 yards and Walter for 19 to the Cincinnati 35. A spike followed by a sack had the visitors facing third-and-15, but Yates ran 17 yards for a first down. Three plays later, the Texans were again facing third down and this time a pass interference penalty on CB Adam “Pacman” Jones moved the ball 17 yards to the six. From there, Yates threw to Walter for a six-yard touchdown with two seconds left. Rackers added the all-important extra point and Houston came away with a dramatic 20-19 win. The Texans had the edge in total yards (412 to 285) and first downs (25 to 16) as well as time of possession (31:44 to 28:16). However, Houston also turned the ball over four times, to two suffered by the Bengals, and Cincinnati recorded five sacks, to one by the Texans. T.J. Yates completed 26 of 44 passes for 300 yards and two touchdowns while giving up one interception. He also rushed for 36 yards on five carries. Owen Daniels had 7 catches for 100 yards and Kevin Walter contributed 6 receptions for 76 yards and the game-deciding TD. With the one long carry, Ben Tate led Houston in rushing with 67 yards on 8 attempts while Arian Foster was held to 41 yards on 15 carries, although he added 33 yards on four catches. For the Bengals, Andy Dalton was successful on 16 of 28 throws for 189 yards and a TD, giving up no interceptions. Cedric Benson ran for 91 yards on 21 attempts and A.J. Green (pictured below) topped the receivers with 5 catches for 59 yards. Mike Nugent was successful on all four of his field goal attempts. With a Tennessee loss shortly thereafter, the Texans clinched the AFC South title and finished with a 10-6 record. Cincinnati, given scant chance of making the postseason after the loss, nevertheless won its next two games and qualified for a Wild Card slot at 9-7, which placed third in the AFC North. The teams met again in the Wild Card playoff round and Houston won to advance to the Divisional level, falling to Baltimore. T.J. Yates ended up completing 82 of 134 passes (61.2 %) for 949 yards and three touchdowns along with three interceptions. In the postseason, he was 28-of-55 for 343 yards with a TD and three interceptions. He returned to being a backup in 2012 and threw just 32 more passes over the course of the next two years before being traded to Atlanta. The 300-yard passing performance against the Bengals remains his best single-game total.